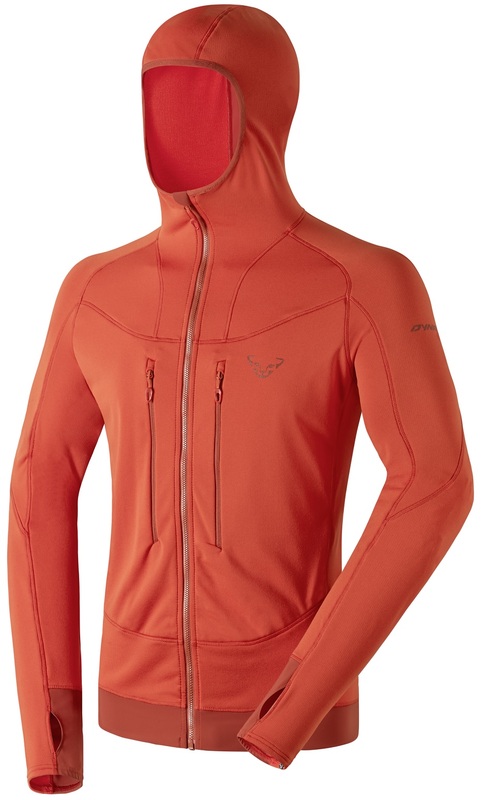 The Thermal Hoodie is an awesome Technostretch jacket for casual racing and training. Made by Italian manufacturer and tongue-twister Pontetorto, the fabric is a light blend of polyester and spandex woven into a grid pattern that makes it warm and breathable. The waffle structure on the inside enhances moisture wicking and the 4-way stretch design keeps everything moving with you. With small skin pockets and thumbholes, the jacket is ready to be run uphill. The hood will be there when you reach the top and need some downhill protection. Technostretch is so good that Pontetorto is being sued by Polartec. 4-way stretch, elastic hem, and thumbholes keep everything in place. Garment is Bluesign® approved with rigorous production methods. I've used this piece for just about every weather condition while touring and out in the backcountry. It works great as a midlayer under a windshell while out on more moderate-paced tours between 0 and +30F, or as an unzipped top layer for faster-paced workouts/warm-weather tours. It's not super wind-blocking but it will repel light snow/rain pretty easily. Best features: long sleeves for easy striding; HUGE front pockets for storing skins (not just teensy race skins, but big >100mm skins too), drying gloves, nordic wax, Snickers bars, whatever; hood zips all the way up for added warmth on blustery days. Worst features: tears easily (a couple rips after using this as an outer layer while schwacking through krummholz approaches), hood will flap awkwardly if not zipped up. I've used the preceding version of this hoodie a ton over the last year. I'd say it's similar warmth to a Patagonia R1 except it doesn't quite let as much wind blow through you if you're wearing only this and light undershirt. I'm not a fabric expert, but it's a bit tighter weave. I use it as an outer layer for touring or nordic if it's above 25 and not too windy. It breathes well and is pretty comfortable. The hood fits comfortably under a helmet and the chest pockets will fit race skins. My main complaint is that the front zipper can get stuck on the fabric that runs behind it, because the fabric is pretty flimsy there and gets jammed up in the zipper. If this is fixed in the newer version, then this is pretty hard to beat as a really solid outer layer on mild days, and a breathable but warm midlayer on colder ones. The fit is definitively euro. At 6'2 170 I struggle to find a good compromise between form fitting and adequate length in most things, but typically fit well in small or medium patagonia and salomon apparel. I have a medium in this and I find the sleeves and torso length to be a bit short. Now, it looks like they added thumb holes to the 2.0, so hopefully that corrected the sleeve length issue.